UNC Chapel Hill employees have a long and impressive history of giving back to the Chapel Hill community. A group from UNC’s Friday Center for Continuing Education has continued the tradition at Family House, building teamwork along the way. For the past two years, this group, led by Jill Conrad and including Anne Bisese, Jody Cashion, Kathy Morgan and a slew of others from the Friday Center, has provided comfort and beautiful surroundings for our guests. You can find them organizing our kitchen cabinets, cleaning the kitchen, gathering donations from our wish list, planting seeds, weeding, folding laundry and preparing meals. 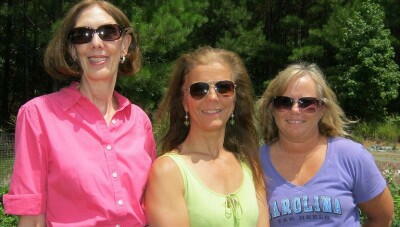 Jill, Anne, Jody and Kathy tell us that volunteering at Family House has brought them together as a team. They’ve seen first hand how much our guests appreciate their hard work, especially when they see guests sitting on a garden bench amidst all the flowers they’ve nurtured. Seeing a smile on a guest’s face tells them they’ve done their job. What started off as a two-year volunteer commitment, thanks to the support of Rob Bruce, Director of the Friday Center, will likely continue for years to come. We appreciate this dedicated group of volunteers!